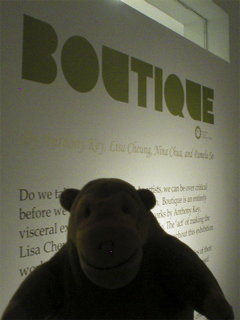 "Let's see how they did"
Mr Monkey scurried into the Chinese Arts Centre's display area. 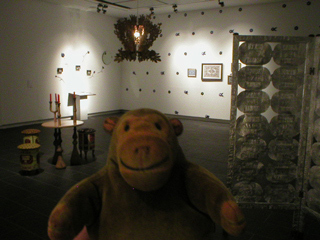 He had a quick look at the exhibits from the doorway, then read the description of the exhibition. Each of the four artists was expected to rediscover the personality of the material they work with, and to add a new function to the artwork. You can read about the exhibition at the Chinese Arts Centre website.